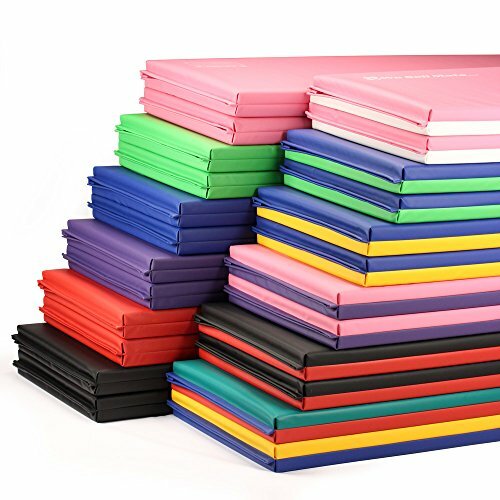 Folding gymnastics mats provide firm cushioning for aerobics studios, Pilates practices, martial arts academies, home gyms, child play pens, and many other applications (Source). As the name implies, they fold up, with Velcro on the sides so that you can attach multiple mats together to cover wider surface areas. Typically, they have 4 panels, so you can even fold them in half to create thicker cushioning (great for tumbling). Some parents buy them for their children who are cheerleaders or high-school tumblers, or even to line the play areas for their toddlers (Source). There are a bunch of professional-quality options out there, but our favorite is the We Sell Mats foldable gym mat. One buyer we spoke with who runs a karate studio says that these mats provide quality cushioning that isn't too soft and squishy when you fall into it. Indeed, his karate students can train on it-it's easily firm enough to support them in their stances but soft enough to cushion their falls. Another buyer praised these mats saying that they are professional-quality, what you would expect to see in a gymnastics school or true, high-quality martial arts academy. The We Sell Mats folding panel mats are designed for gymnastics, tumbling, parkour, pilates, martial arts, yoga, general home exercise routines, stretching. It's built from polyethylene foam that is free from dangerous elements like formaldehyde, lead, and phthalates. 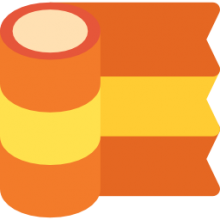 It comes in two different thicknesses, with panel measuring 4' x 2' x 2" and 4' x 2' x 1.5". The rugged vinyl is engineered to be non-absorbent, and resistant to puncture, fire. Since it has Velcro on all four sides, you can connect multiple mats together so you can tumble and exercise in large surface areas. Let's take a look at 5 of the best-selling foldable aerobic mats online and see how they compare. This folding gymnastics mat offered by We Sell Mats is light, well-designed and perfect for yoga, Pilates or martial arts. Users love the design and the colors, but some do note that the exercise mat is not as thick as they expected. This tumbling practice mat is made of non-toxic, lead-free ECO vinyl and cross-linked polyethylene foam and it has Velcro on all four sides so that you can hook several mats together. Moreover, the mattress is 2-inch thick, and there is a sewn-in handle so that you can carry it wherever you go. It’s available in several sizes – 2’x6′, 4’x8′ or 4’x10′ and five colors. In general, users are extremely impressed by the construction, design and durability of this folding aerobics mat. A happy buyer mentions that he feels less worried when his 6-year-old daughter uses this mat to tumble and flip and that the quality is outstanding. Another satisfied customer comments that the practice mat arrived fast and in perfect condition. Moreover, it folds easily and doesn’t take too much room to store. A purchaser also shares that this gymnastics folding mat is thick, soft and firm and that her children tremendously enjoy using it. However, some customers have complained that this exercise mat is not as soft as they expected and that it doesn’t provide enough cushioning. A user also complained that the vinyl is loose and that the mattress is only 1 ½ -inch thick. 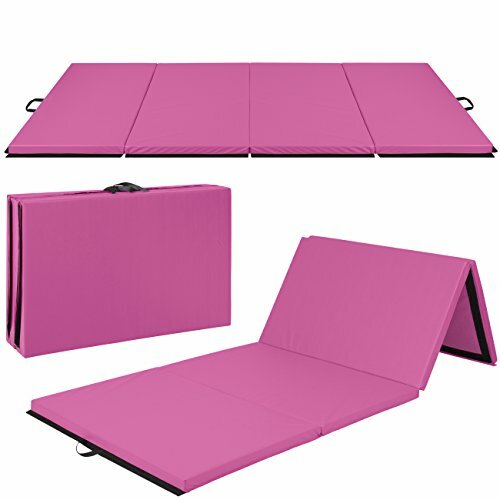 This folding exercise mat offered by Best Massage is well-made, comfortable and an excellent choice for home aerobics. Users love the color, but some do note that the surface is slippery and that there is a smell present. This portable panel mat measures 8″ x 48″ x 24″ when folded and 8′ x 4’ when it’s flat. The dimensions of each panel are 48″ x 24”. Moreover, this folding mat has a sewn-in handle for transportation, a non-absorbent PU leather cover, Velcro straps on each end, easy-to-clean vinyl cover and it’s made from high-density, 2-inch thick ECO foam. As a whole, reviewers are extremely satisfied with the performance, thickness, and usefulness of this burgundy folding panel mat. A user shares that this gym mat is professionally made and the quality is better than he expected – even after months of regular use, there are no signs of tearing. Another happy client states that this folding aerobics mattress is solid, firm and he doesn’t feel a thing when he falls. A purchaser also mentions that this folding mattress for gymnastics folds quickly and you have to wipe it down from time to time to keep it clean. The reviewer adds that the mat doesn’t smell at all and that her children can practice on it for hours. However, some customers have complained that this mat is not safe for tumbling because it’s too light and inadequately padded. Some also state that the handles are not well-stitched and that the cover starts to come off after only a couple of weeks. If you are searching for a high-quality portable exercise mat, you might take a look at this aerobics mat offered by Best Choice Products. Users love the design and the thickness of the mattress, but some do note that the handle is not very durable. Made of 2-inch thick high-density foam, this folding exercising mat measures 10 x 4 feet when it’s flat, and it consists of four panels, covered with a durable PU leather cover with sewn-in handles. There is also Velcro on each end, so you can connect it to other mattresses if you wish. Users have a very high opinion of this thick gymnastic mat, and they praise its design, performance, and softness. A buyer comments that she was skeptical at the beginning, but the mattress turned out to be thicker and bigger than she expected. The reviewer also adds that her daughter regularly does gymnastics and the mat is holding pretty well. Another satisfied purchaser mentions that this folding exercise mat is firm but soft, and it’s ideal for stunts and tumbles. 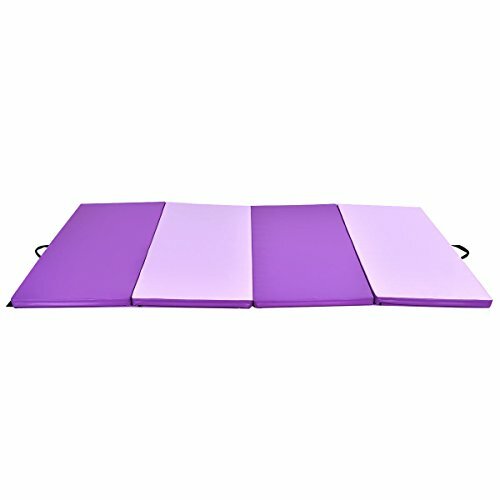 A user also says that this portable gym mat is long enough so you don’t have to worry that your child would slip off the edge. She would recommend it to anyone looking for the best exercise mat. However, some customers have complained that this tumbling mat is not as durable as they expected and that it started to rip apart at the seams after a couple of months. Some also state that the surface is slippery and that the Velcro is not on all sides. This 4’x10’x2″ multicolor portable gym mattress offered by Giantex is durable, well-designed and useful for aerobics, martial arts, and yoga exercises. Users love the softness and the thickness of the mat, but some do note that the handles rip easily. This folding tumbling mat consists of four panels (each 4 x 2.5 feet), made of high-density Epe foam inside and Eco-friendly PU leather on the outside. It weighs 20 lbs, and each panel has a zipper, so it’s easy to clean the cover or change the foam. There is also Velcro on two sides so that you can connect it to other mats with no efforts. A purchaser shares that his multicolor folding mat is perfect for home use and that it’s so thick and firm that she doesn’t have to worry that her baby daughter would hurt herself. Another pleased buyer mentions that the handles are very convenient and that he can carry or drag it anywhere he wants. The reviewer also states that he is very impressed with the quality and that the gym mattress is holding up pretty well, even though his daughters use it almost daily. A user also adds that he would gladly buy another Giantex folding gym mat because it provides adequate cushioning and that he highly recommends it. However, some customers have complained that they received a torn mattress and that it’s not as firm as they expected. Some users also note that the zipper broke and that they don’t recommend it for adult aerobics exercises. This 2-inch thick portable gym mat offered by Globe House Product is easy-to-carry, firm and well-made. Users love the durable design and the price, but some do note that the surface is slippery. This folding aerobics mat is 2-inch thick, and it measures 4 x 8 feet when it’s flat. It’s constructed of four panels (4 x 2 feet) made of high-quality Epe foam and eco-friendly PU leather, and it weighs 16 lbs. Moreover, each panel has its own zipper to allow you to clean the cover or change the foam. If you want to connect this gym mat, you can use the Velcro strips on each end. A customer shares that this folding panel mat is perfect for cheerleading exercises and that you can fit it in your car with no efforts. The reviewer also adds that it’s an excellent choice for young children to practice cartwheels and bridges. Another happy user states that this aerobics mat provides adequate cushioning and that it’s spacious, solid and easy-to-clean. He recommends it to anyone looking for the best folding gym mat. A user also says that her daughter loves to tumble on the mat and that it doesn’t take much space when it’s folded. However, some customers have complained that the handles are not sewn well, and they will tear pretty quickly. A user also complains that the folding gym mat he received didn’t have Velcro on the sides and therefore, was useless for him. The first folding mat we took a look at it was the We Sell Mats tumbling martial art mat. 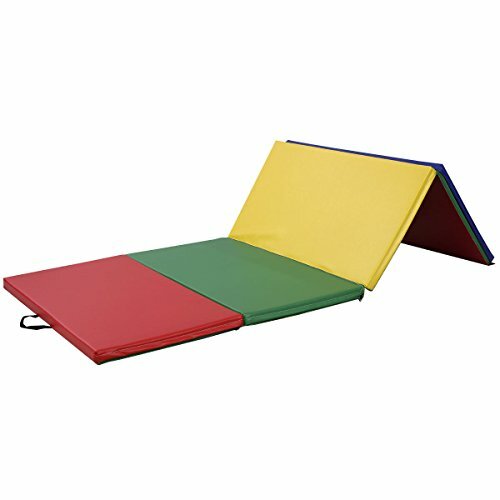 These gymnastic mats come in a variety of different colors including black, lime green, rainbow, royal blue and yellow. The manufacturers say that they are specifically designed for people practicing Pilates, as home gymnastics equipment, yoga, martial arts, gymnastics, tumbling, home exercise- really anything where you need safe questioning for activities. They are built from polyethylene foam and the manufacturer say that they are free of formaldehyde, lead and phthalates. Because they have a Velcro on all four of their sides, it's easy to connect several mats to cover the surface area of a large workout space, like a gymnasium. If you buy the 4 panel foldable mat you can even fold them in half so that it is two panels thick, providing really strong cushioning. Another buyer purchased several of these foldable tumbling and exercise mats to line his home gym, saying that they are firm enough to provide him the needed support when he kneels on the ground and rolls around. A jujitsu instructor said that the mats are great for his home martial arts practice, saying that the surface has a gripping texture that isn't too distracting for his fighting stances. 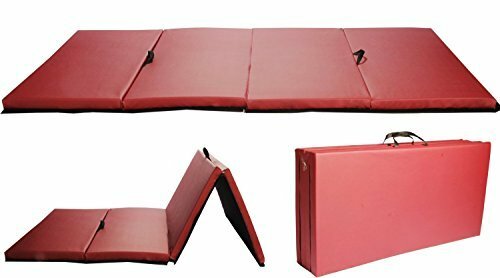 The second option we looked at was the Best Massage folding panel gymnastic mat. The manufactures describe their exercise mat as being 2 inches thick of high-density, ecologically friendly foam. Designed to be particularly portable and storable, each folding mat includes a handle that is sewn into the mat, as well as Velcro straps at either end. As with other mats, they can be connected together so that they cover a larger surface area for tumbling runs, functioning as home gymnastics equipment, movement-intensive exercise regimens, outfitting karate and mixed martial arts studios, etc. The third folding aerobic mat we took a look at is manufactured by Best Choice Products- it comes in pink, black, blue, and multicolor. The manufacturer says that it is constructed from 2 inches of high-density foam and is ideal for yoga studios, Pilates practitioners, aerobics practices as well as martial arts studios. As with other of the foldable exercise mats, it includes carrying handles and has a four-panel design with Velcro straps on either end for easy transportation. One buyer described to us purchasing this cheerleading mat because their son is heavily into gymnastics at his school. They were pleasantly surprised at how well-constructed and elegantly designed the Best Choice Products aerobics mat was, saying that it was a relatively inexpensive option that has withstood the test of high-intensity aerobic training. Another buyer told us that a lot of the foldable exercise mats they had seen in local retail stores like Target and Walmart were just too mushy and squishy for their tastes. This particular gymnastics mat was different in that respect- it's very firm, while still providing the cushioning that high-impact exercise requires. Another reviewer explained to us that her daughter is a cheerleader and required cushioning indoors so that she could practice her cheering. They were able to outfit a spare room in her house with these sprawling aerobic mats so that her daughter could practice her tumbling, falls, and cheerleading routines on a sturdy and thick surface that protects her joints from injury. Another option we took a look at was the Giantex gymnastics mat- this is another foldable option that, like other mats, can connect together with Velcro attachments- functioning as a cheerleading mat for many parents. Buyers we spoke to say that primarily they have used it as a gymnastics mat, saying that it is a reasonably priced option that provides safe cushioning for their high-school aged children to practice falls on. Other buyers say that for their one-year-old twin children, these mats were an ideal way to cushion the ground of their play area to keep them safe from falls. A preschool even uses them for play time, unfolding these durable and firm mats so that a dozen children can bounce, roll and tumble around without risk of injury.